DURHAM –It looks like something out of a Batman movie. Yet the black suit which draws the eye and spurs the imagination is not part of any movie set, it’s the product of work done by a local Oshawa startup company. It’s one of many tech businesses operating across Durham Region and part of an industry some hope could change the face of the local economy. “There’s no way to know where you’ve been hit, this lets you know. You feel the hit,” says Brodie Stanfield of how it would feel to play a game in the ARAIG (As Real As It Gets) suit. “It tells you this is really happening,” adds Michael Stanfield, Brodie’s father. 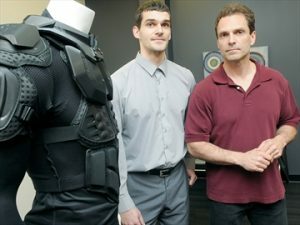 The two are cofounders of the Oshawa-based IFTech company and the suit they’ve created is getting their business a lot of attention. The suit is a wearable multi-sensory stimulation device meant to immerse players in the reality of a gaming world by stimulating the senses. It’s also the focus of a recently announced partnership between Durham College and IFTech. The college will be working with IFTech on an applied research project designed to support the company’s growth with the hope of bringing the suit to the market within six to eight months. Michael Stanfield credited the Spark Centre, a local non-profit organization, as “instrumental” in involving the college in their business. His son says their business needed different pathways for developing ideas and the Spark Centre offered that by helping connect the two men with the college. “One of the goals of the Spark Centre is to make sure we connect the tech talent from the schools to local talent,” says Dennis Croft, executive director of the Spark Centre.